The WPT Grand Prix de Paris wrapped over the weekend. 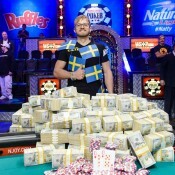 WSOP Europe bracelet winner Theo Jorgensen captured the event, banking €633,902 (like $782,000ish U.S. American dollars). 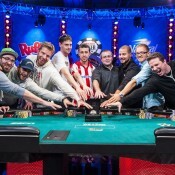 Antoine Amourette eats frog legs came in second to cash $405,906 and Per “se” Linde	was third for $289,935. In related news, half-man, half-amazing Freddy Deeb won the inaugural WPT Paris High Roller, banking €290,000. Deeb defeated Sorel Mizzi, who is running like God this year, for the title. Get a full recap of the event here. Has Doyle Brunson Lost that Loving Feeling?